According to a survey completed by National Geographic in April of 2000, approximately 15% (which translates to roughly 40 million people) of Americans had at least one tattoo marked on their body. This art form has translated into a $1.65 billion industry – just in the United States alone. While the first tattoo parlor in the states appeared in the early 1800s, and focused their business mainly on soldiers and sailors, the art of tattooing has been a part of American history long before the parlor first opened its doors. If you know your history, you’re well aware that the American soil was graced by many tribal communities long before the first European settlers descended from the ramps of their sailing ships. These people, thought to be primitive by the cultured and well-traveled explorers, were similar in lifestyle to other tribal and island communities across the ancient world. They possessed their own governing systems, hierarchies, beliefs, and rituals. Among these rituals, the art of marking the body – tattooing – was prevalent. America is a large body of land mass, and in such, was home to many unique tribal communities. In the north, you could find your Inuits, also called Eskimos. In the forest regions of the US, such as the north-east, you could find Woodland Indians, hunters, and gatherers. There was yet another form of Indian that roamed the Plains. Each and every community had their own systems, rituals, and methods as the expansive regions between them were too hard to navigate during the early stages of travel. For those on horseback or on foot, the distance between two tribes could range from a few days trek to several weeks or even months – depending on location. Despite the distances between them, they all reveled in the art of tattoo. Undisturbed by the Christian faith, who denounced tattooing as barbaric and sacrilegious in the mid 700s AD, the Native American tribes believed tattooing to be sacred, spiritual, and incorporated the practice into their everyday lives. However, each area’s practices were slightly different. The Eskimos, for example, believed tattoos increased feminine beauty. Their women were tattooed according to rank and status in life, usually across their faces. These tattoos depicted whether the woman was ready to marry and bear children, or if they held a specific title or position in the tribal community. The designs were complicated, but generally included sets of lines drawn across the chin and the upper check area, directly across from the ears. The artwork was created by dipped a thread in soot and dragging it under the skin, thus leaving the black residue behind. In the Eskimo community, the tattoo artist was generally a woman – usually of an elderly age, and most often related to the person being tattooed. These northern tribes believed that only elaborately tattooed men and women were allowed passage into the afterlife. Tattooing began at puberty for these tribes, generally on the wrist; however, the tattoos bore different meanings for each gender. Women’s tattoos were to symbolize their first menstruation, men’s depicted their first successful hunt. Located in the northern prairie region, Cree Indians celebrated a unique concept of tattooing. The men of the Cree Indian tribes would tattoo their entire body over many, many years. However, they limited the number of tattoos allowed for women – restricting married women to three or four minimal lines across the face. In the Pacific coastal region, several different communities lived alongside each other. Historians believe that as many as 300,000 individuals were located in this area before the Europeans’ first arrival. Tribes such as the Yurok, Tolowa, Hupa, and the Chimariko called this region home. 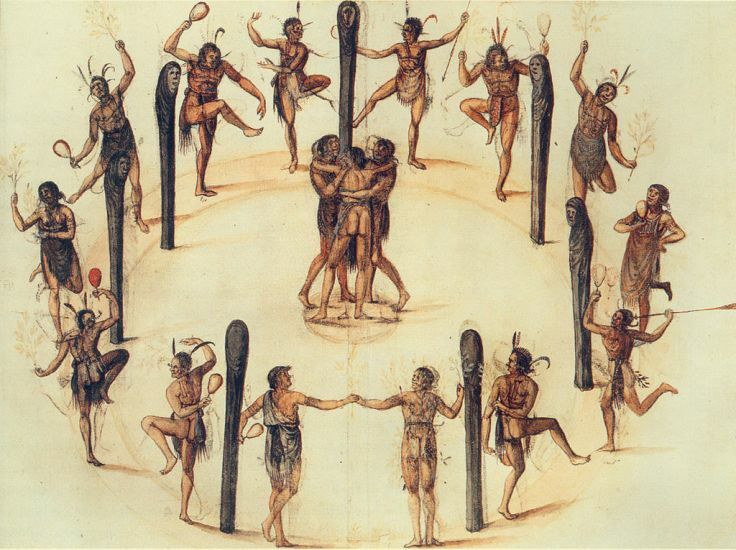 Each tribe had their own unique methods, designs, and reasons for tattooing. For the Yurok tribes, tattooing was more common among the women than men. At age five, a young girl would have a simplistic black line stretched below the chin. From there, every five years or so, the girl would have another line marked in a parallel position to prominently display her age. Tolowa Indians would tattoo three parallel vertical lines on the chin of their girls just before puberty. Women in the Hupa tribes also wore similar lines on their faces. This was a coastal community which utilized a form of seashell as a payment method. The men would often tattoo a size guide on the inside of their forearm in order to help them determine the worth of the shell. Chimariko, Shasta, and Chato Indians began to decorate their bodies early in life. These decorations consisted of designs on the arms, hands, cheeks, chins, wrists, and legs and appeared on both genders equally. These tribes utilized a stone knife to carve the designs on the desired area, and then a colored ink created from a mixture of soot, grass, cobweb, or flower was rubbed into the wound. The Yuma tribes would decorate their faces with exquisite patterns indicating family status and ties to the community. Warriors were decorated to give a fierce appearance. It was customary to be tattooed in this tribe, as they believed access to the afterlife would be denied to those who wore no tattoos. In the southeastern regions, tattooing was extremely important. They practiced scraping in addition to tattooing – in which designs would be etched in the skin without ink, thus leaving a scarred pattern behind. Scraping usually consisted of the individual’s full name and happened over a process. Usually performed on young men, their first given name would be scraped into their skin at childhood. When they were deemed a fledgling warrior, their second name would be added. Upon his first kill, generally proven by taking an enemy’s scalp, arm, or leg, their final name would be scraped into their skin. When it came to inked tattoos, the art form was very common in tribes such as the Seminole, Creek, and Cherokee. These tribal tattoos actually consisted of full designs including flowers, stars, animals, moons, and other popular symbols. For these tribes, men were more heavily tattooed than the women; however, both genders partook in the practice. To these tribal communities, tattooing appeared to be more ornamental than spiritual. While the Native American tribes were relocated, slaughtered, or integrated, the patterns and designs of their tattooing practice survived – whether through devoted descendants or through detailed pictures and descriptions captured by the European explorers and historians. Many tribal tattoo depictions surface in today’s modern tattoo culture, breathing new life into this magical art form left behind by the original American people.